Welcome to Early American History. We are going to pick up right where we left off at the end of year 1, with explorers. 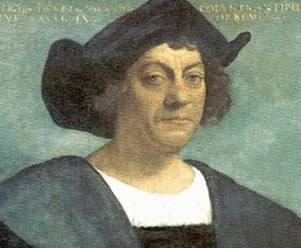 You are going to be reading about one explorer in particular, Christopher Columbus. You will be reading The True Story of Christopher Columbus. That’s the link for those who want to download the book. You are going to be reading the first seven chapters. Today you will read the first half of chapter 1. Look at the photo of Columbus. Look at a map of his most famous voyage. Here are two paintings of imaginings of what it was like when Columbus landed. What do you observe? Welcome to Early American History. We are going to pick up right where we left off at the end of Year 1, with explorers. You are going to be reading about several explorers, some you met briefly at the end of ancient history. But I want you to remember something, before America was “discovered,” it had already been found and lived in. Here’s a map showing America’s territory before Europeans invaded the land. You are going to be reading some of Discoverers and Explorers. This is the link for those who want to download it. Today you will read the first chapter. Here is the audio version if you want to listen to it. *I suggest (optional) printing out 14 pages for your child to use to take notes on for each day. Write about what people believed 400 years ago. Tell someone about the chapter. What was Columbus’ idea? (*)If you like, choose a coloring page. Click on Columbus on the map key. Read the first half of chapter 2. Play the Christopher Columbus video. There are different ideas about Christopher Columbus. There are many different ideas about many events in history. Everyone has a different perspective. Click on Cabot on the map key. Tell someone about the chapter. What did people think about Columbus’ idea? Click on Cartier on the map key. Read the first half of chapter 3. Tell at least three facts to someone. Click on De Soto on the map key. Read about him and write about him. Tell someone about the chapter. How did Columbus gain a queen for a friend? Click on Coronado on the map key. Research him and write about him. Read the first half of chapter 4. Click on Cabrillo on the map key. Tell someone about the chapter. How did the Admiral sail away? Click on Hudson on the map key. Read the first half of chapter 5. Do a Columbus word search. Here are some other puzzles you may want to try. Click on Champlain on the map key. Tell someone about the chapter. How did the fare on the sea of darkness? Click on Marquette and Jolliet on the map key. Read the first half of chapter 6. Try the crossword puzzle. Click on one of the blank lines in the crossword puzzle and it will give you the clue. Do as many as you can. At the end, if you are still stuck on one, you can click on solve to see the answer. Click on LaSalle on the map key. Tell someone about the chapter. What did Columbus discover? Read this site on Columbus. Read the first half of chapter 7. Tell someone about the chapter. How did a boy bring the Admiral to grief? You may finish the book on your own if you like. Columbus goes on to make three more voyages, but he never knows what he’s really found! Draw on all 10 explorers’ routes. Use a different color pencil for each one. Make a key that shows which line belongs to which explorer. Do a family reading of this play on Christopher Columbus. Assign roles before each scene. You don’t have to do costumes and sets. Just read with flair! If you don’t have anyone to do the play with, then you can read this animated book. If you are allowed, you can usually find cartoons on Columbus online. Here’s a short video. First, before the first Europeans arrive and become Americans, you are going to learn a little about one group of Native Americans. *Complete the maps layer lapbook piece. You can read on this page about where they lived. 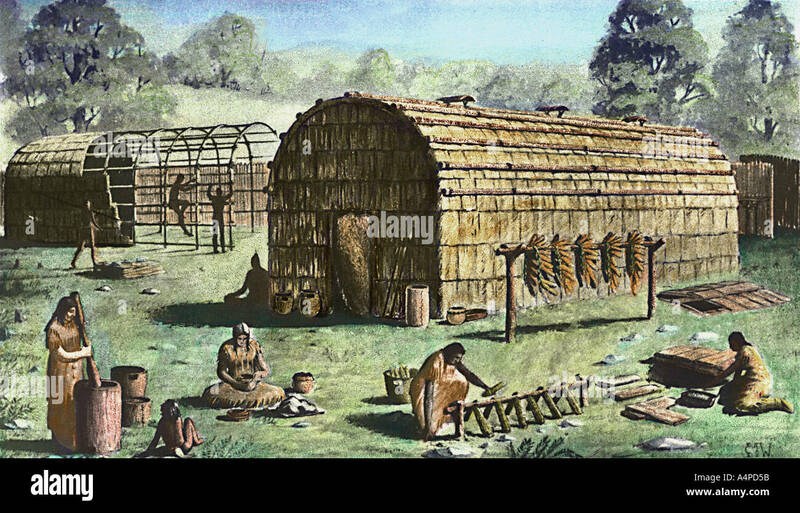 Look at an Iroquois home, a longhouse. Here’s the same image bigger and in color. Here are pictures of the inside. What do you see? Reading Options: Pilgrim Stories or This Country of Ours parts 2, 3 and 4. Pilgrim Stories is easier, more story than facts, but maybe you have already read it. You would read 2 chapters a day, except for the few chapters toward the end that are 10 pages. Those can be read alone on a day. Maybe you could read these stories aloud to younger brothers and sisters. The Country of Ours shares more historical details. You will read one chapter a day. (*) If you like using notebooking pages, print out these 5 pages to use to write about the Iroquois. Write about the Iroquois League of Nations. *Complete the League Flap Four. On the four flaps write: Government, Constitution, Purpose, Borrowing Ideas. Write inside something about each of these things. *Complete the Five Nations piece. You can read about each nation here. *Complete the wampum lapbook piece. You can read about wampum here. **Complete the shoe lapbook pieces: moccasins and snowshoes. 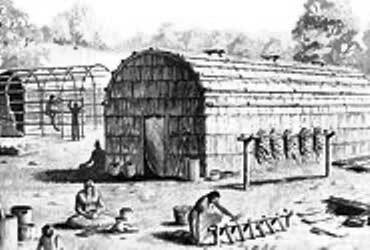 There was a lot the Europeans coming to America could learn from the Iroquois about how to live and survive. You can read about their shoes and more here. You can read more about their clothing here as well. Read about Sir Walter Raleigh. *Print out this Early Settlers Timeline page. Write in Sir Walter Raleigh or The Lost Colony of Roanoke next to Raleigh’s picture on the line for 1552. Keep this timeline page. You will be adding to it as you continue learning about this time period. Start a timeline. Write a date. Insert a picture. Write text. You can do it in a word processing program, a drawing program, power point, or however you like. Save it and add to it as we go along. (Be creative! Here are some templates to give you some ideas.) Here’s a picture of Sir Walter Raleigh to get you started. It’s from Wikipedia. That’s a great place to get pictures from. Watch this movie on Captain John Smith. Learn about the settlers landing and building a fort in Jamestown. Watch this short video on landing in Jamestown. *Print out the three timelines pieces. Watch this video on Life in Jamestown. *Read the quote to practice reading cursive handwriting. See if you can find all of the letters of your name in there. Want to try to figure out your name in cursive? Try to build a fort. Can you use sticks to make a triangle fort? Today gather your materials and plan your building. Maybe cardboard could be used to glue sticks to or to stick toothpicks into. You have Days 24 and 25 to build. Listen to the story of John Smith and Pocahontas. You can read along with the book and see the pictures too! *Choose an activity page to do. They are marked with how difficult they are. Watch this short video on the Jamestown Colony. Work on building your fort. Play this Jamestown game. It’s long. You don’t have to do all the mini-games. Those are just for fun. Watch the first part of the Charlie Brown Mayflower movie. Watch the first half, 12 minutes. What are some of the things that happened while they were traveling? Write the Mayflower on your timeline on one of the lines for 1620. Watch the first part of this Mayflower movie. (*) Become a character about to sail to America. Write a diary entry. You can print these pages if you would like to use them to write on. You will write a diary entry each day this week. Include a date on each entry! Watch the second half of the Charlie Brown Mayflower movie. Where did they land? Find Plymouth on the map of early America. Plymouth is in Massachusetts. You can see the red spot is where Plymouth is. Can you find where it is on the map? Watch part 2 of the Mayflower movie. Write a diary entry from a day on board ship. Read through Remember Patience Whipple’s diary of her voyage on the Mayflower. Click to turn the pages and use the links to see more. Do the activities. Write the Mayflower Compact on your timeline on one of the lines for 1620. Did you see the picture in her diary of the pilgrims signing this agreement they made on the ship before they stepped foot in the New World? Watch part 3 (final part) of the Mayflower movie. Write a diary entry from a day in your life. Make sure you put the date on the diary entry. Read half of this page of questions and answers by Desire Minter, a Mayflower passenger. Write a second entry in your diary. What did you eat? What did you play? Did you have to do chores? Did anything exciting happen on the boat? Finish reading this page of questions and answers by Desire Minter, a Mayflower passenger. Write a final diary entry. Add the Mayflower to your timeline. *Print this page and use the map to answer all of the questions. Listen to and read the Mayflower Compact. Give this worksheet to a parent to keep in your portfolio. Read Pilgrim Stories chapters 33 and 34. *Do you know who is who? Do research online if you need to in order to find the right answers. Give this worksheet to someone to keep in your portfolio. *Print pages 28 and 29 of this activity booklet on William Bradford. Do the activities. On page 29 it mentions a video. You will just order the pictures in the way you think they happened. Use them to tell the story you think it’s telling about the pilgrims. Read the chapter on William Penn. Write a paragraph about him. Click on the most recent date and read the current events and tell someone about what is happening in the world. Read an article. Choose one article. Watch this video on the early settlers. Use the links with pictures to explore and learn about colonial life. Choose what you are interested in. You can use this again on Day 37. Tell someone about colonial life. Watch this video on the New World. Watch this video on the puritan settlers. Use the links with pictures to explore and learn about colonial life. Write a paragraph on the development of the new world. Use what you learned in the video yesterday. You should have at least eight sentences. Make sure you have an introduction and conclusion. *Use this map to label when each area was first settled. Write the dates right onto the map. You can find their settlement dates on this timeline. Read this introduction to life for children at the time of the Salem Witch Trials. Read the history of the Trials. Tituba was practicing witchcraft and there was likely demonic activity going on in the area with those who had brought their false religion with them. The Old Testament talks about killing those who do witchcraft. The New Testament NEVER talks about killing ever as what should be done. If the Puritans were full of the Holy Spirit, then they had power by the blood of Jesus over any demons. They were wrong to act in fear. Those full of faith are never full of fear. Add the Salem Witch Trials to your timeline. Read Colonial recipes. Try one out if you can. Read through this Jeopardy game. I don’t expect you to know the answers, but you can learn them as you click on them and read them. *Read a news article and fill out this chart. You can decide if you would like to include your graph in your portfolio. Make a power point presentation on Daniel Boone (or ask a parent if you would like to make another sort of project.) You will present it on Day 45. Here are three pages to use. Listen to the story Daniel Boone. Tell someone about Daniel Boone. *Print out this mini book on Daniel Boone (Daniel Boone_frontiersman). Make the book and read it. Here is a map of Boone’s “wilderness road” he traveled. *Print the map. Glue it to cardboard. When it is dry, cut it into pieces and put the puzzle back together. How many states did he walk across? *Print out and complete this Daniel Boone matching worksheet. If you forget the answers, go find them in the article. If you don’t know what pelts are, find out! Finish your presentation and present it to an audience. Read it to them. Explain things to them. Answer their questions. Add Daniel Boone to your timeline. Watch this presentation on the French and Indian War. Read about the battles of the French and Indian War. Answer the questions by using the map. Read about the cause and effect of the war and write a paragraph about it. (*) Here are notebooking pages you could use. Read a description of the war and write a paragraph about it. *(Child needs to choose a picture.) Write a postcard. Read the directions on the page. Read about Pontiac’s Rebellion and write a paragraph about it. *Print out the next timeline page (Before the Revolution). Fill in Daniel Boone, Start of the French and Indian War, End of the French and Indian War, Pontiac’s Rebellion. Read about the Proclamation of 1763 and write a paragraph about it. Add the French and Indian War to your timeline. Optional Reading: You have a long time to work on these, 40 days. You can read these until day 90. Watch this video on Benjamin Franklin and tell someone about some of the things Benjamin Franklin did. Watch this documentary on Benjamin Franklin. Watch part 2 after part 1. You can look at pictures of Franklin. Play the matching or concentration game to see what you know. Write a page about Benjamin Franklin. You can use page 8, if you would like a notebooking page. Read the biography of George Washington. Under the biography you can use the links to view the slideshow and play the online game. Read the first thirty rules from George Washington’s list of how one should behave. What’s one you think you should apply to yourself? What’s one that you think is pretty ridiculous? What would you change it to? Read about primary and secondary sources. Go back to number 1 above and read the introduction to the rules. Is that a primary source or a secondary source? The rules are a secondary source. George Washington didn’t write them himself. Read about using documents as a primary source. Jump to page 9 of the pdf. Use the primary documents to answer the questions at the end of the pdf. You can complete this on Day 55. *Choose two activities to complete. Use the primary documents to answer the questions at the end of the pdf. Watch the first thirteen minutes of this documentary on the presidents. Register for free and play this Mission US game. You will play tomorrow as well. If you don’t finish today, you can continue tomorrow. If you finish today, you make different choices tomorrow to see what happens. Play the Mission US game. Play the Patriot Spy game. READ all of the information! I’m letting you learn from the games instead of giving you other things to read. So, take the time to read, so you can learn what happened. Write a speech that tells your neighbors why they should fight for independence. Write a speech convincing your neighbors to support independence. Do the Boston Tea Party activity. Read the newspaper article about the Tea Party in Boston in 1774. Add the event to your timeline. Watch this video on Lexington and Concord. Watch this video on the Declaration of Independence. *Print out the next page in your timeline (The Revolution). Write in Lexington and Concord on the top line. Write The Declaration of Independence on the next line. Read the newspaper article about Declaring Independence in Philadelphia in 1776. Listen to the Declaration being read. Watch this video on Battle of Bunker or Breed’s Hill. If you want (and are allowed to watch another video), the older kids today are learning about the Battle of Trenton. You could also read about it. Read the newspaper article about the waning troops in Trenton in 1776. Read about the Battle of Trenton and Washington’s Crossing of the Delaware. Learn about two turning points in the war. Watch the video on winter in Valley Forge . Write Valley Forge on the next line of your timeline (3rd line). What happened at these places? Read the newspaper article about Saratoga in 1777. Watch the video on Yorktown. Write Yorktown on the last line of your timeline page. Read the newspaper article about Yorktown in 1781. Play the Road to the Revolution game. You are going to be working on a lapbook on the American Revolution. You are also going to be working on a newspaper about the Revolution. *Print out these lapbook pieces and complete them (Who was King George). Read your lapbook pieces to someone. Type the name of your newspaper into this Word doc template (OpenOffice template), or start your own from scratch. Make sure you save it in a folder with your name on it and call it American Revolution Newspaper. If using a computer is hard for you, you can write the name of your newspaper at the top of a piece of paper. You don’t have to use the computer. *Print this lapbook on the American Revolution. (Print pages 4 to 40.) You have 15 days to complete the lapbook and a newspaper assignment. You’ll have to do 2 or 3 pieces of the lapbook each day. Some require no writing or very little writing, so when you have an easier piece to do, do an extra one as well. Follow the directions on the lapbook. Research answers. If you can’t find something, you can go back to the download and read the information included in the lapbook. You will also be working on this newspaper assignment. There is a link on the page to a template in Word that you can use. (Here’s an OpenOffice template.) You can also design the newspaper yourself. Do something every day. Do the pictures and captions on the same day. Write down your who, what, where, when, why and how facts as you research your article choices. You can take a couple of days to write each article. For your free choice you could do anything appropriate to the time period, even an advertisement, or proverb or witticism. Get started today. Each day you’ll do 2 or 3 lapbook pieces and a part of your article. You must be finished by Day 80. Here’s one site you could use for information on battles and people. There is also clip art maybe you would like to use. Here is a site with quotations. Here are more facts, many about women who fought in the war. Here is a page of battle statistics. Choose a battle to write your article about. Here are some ideas. Go to this page on Wikipedia and type the name of a battle into the search box. Copy and paste a picture from the Wikipedia page into your newspaper. Make it smaller by clicking on it and dragging in the corners. Write a caption for the picture. You can draw a picture if you aren’t using the computer. *Print out page 1 of this lapbook piece (Map of 13 Colonies). Write in the names of the colonies. Here is a map to help you. In the place on your newspaper for the story about a battle, you will write about the battle you chose yesterday. You might need to go here and find some information. Write a Title/Headline for your story. Make sure you write whole sentences for the why and how. *Print out this lapbook piece and complete it (Taxation Without Representation). Read your lapbook piece to someone. Choose two Revolutionary War quotes and copy them into your newspaper. Make sure you include who said it! Here are some quotes to choose from. *Print out these lapbook pieces and complete one page, just 2 people (Patriots). You can look here for information. Write 10 interesting facts into your newspaper. Just list them with numbers 1., 2…. Here are some facts. Here are two other places to find facts: one, two (scroll down for “fun facts”). *Print out these lapbook pieces and complete them (Stamp Act and Ride of Paul Revere). Create an advertisment for your newspaper. What do you think people would buy? Make sure it fits the time period. Put your advertisement in the “free choice” space on the newspaper. You have finished one page! Complete another page with two more patriots. Here is the page with names and information. You can look up information elsewhere as well. Choose a person from the American Revolution to write about. Here are some ideas. Go to Wikipedia and type the name of the person into the search box. Copy and paste a picture from the Wikipedia page into your newspaper. Make it smaller by clicking on it and dragging in the corners. Write a caption for the picture. In the place on your newspaper for the story about a person, you will write about whomever you chose yesterday. You might need to go here and find some information. Choose a woman from the American Revolution to write about. Read this page to learn facts about Deborah Sampson, Molly Pitcher and Mercy Warren. If you want, find a picture for your article and put it in your newspaper. Complete the last page of patriot leaders. In the place on your newspaper for the story about a person, you will write about whomever you chose on Day 74. You might need to go here and find some information. You are finished your newspaper. Print it out! *Print out and complete this lapbook piece (Join or Die). *Print out and complete this lapbook piece (Englands Reason for Taxing the Colonies). *Print out and complete this lapbook piece (Cause of the War). *Print out and complete this lapbook piece (Can You Answer). *Print out and complete this lapbook piece (Boston Tea Party and Sugar Act). *Print out and complete this lapbook piece (Boston Massacre). *Print out and complete this lapbook piece (Battles). Read your lapbook and newspaper to an audience. Give your newspaper to a parent to add to your portfolio. See if there is a recipe you can try. Add your newspaper to your portfolio. Watch this video on the Constitutional Convention. Watch this video on the Constitution and its Preamble (the beginning words of the Constitution). *Write Constitutional Convention on the first line of the timeline about After the Revolution. Add the Constitution to your timeline. Read through this list of questions and answer what you can so far. Write your answers some place where you can add to it every day. Number them so you know what questions you are missing. It would be best to type your answers so that you can list them in order and easily see what you have missed so far. Read about the Preamble . Read about the Articles of the Constitution. Read through this list of questions and answer what you can so far. Read more about the Constitution. Read about National vs. State Government. Read about the Branches of Government. Watch this video on the branches of government. Read about checks and balances. Learn more by studying this page on the branches of government. Play the Branches of Power game. Scroll down to Branch o Mania. Who has what power? Separate the powers. Read through this explanation of the Bill of Rights. Today read from the beginning through Amendment 4. *Print pages 15 and 16 (the word search and the matching of the amendment with the right). Today, complete the word search. Print pages two through six, worksheets on the Bill of Rights. Do the first three pages today. Mark what rights you think are important. Then match the amendment to the “protection” that was similar IF there was one. You can check your answers when you are finished. Read through amendments 5 through 10. You can check your answers when you are finished in the back of the pdf. Read through the Bill of Rights, the first 10 amendments, or changes to the Constitution. Complete the fill in the blank worksheet (from Day 86). Play the Bill of Rights game. Choose Elementary Level. The Bill of Rights is the first ten amendments, or changes to the Constitution. Write a list of what rights you think are important and that you think should be protected. Play the Bill of Rights game. Choose the Secondary Level. Watch this video on how a law is made. Read through the steps of a bill becoming a law. Write a paragraph about what rights you think are most important and why. Also include what you think should be rights and why. Write and submit a proposal for a new law. What law would you like to see made? Use this website to research any answers you are missing. If you are finished your answers, you can go here and click on the mouse picture in the bottom right corner of the box at the top of the page. You can watch a bill become a law. Play this matching game about Adams. Write John Adams on the second line of your timeline with the date when he became president. You are going to start reading a book about Sacajawea and Lewis and Clark. We will start studying them in a few days, but Sacajawea was an Indian that helped them and you are going to be learning something about the Plains Indians this week. Read the first three sections of the book. Before each section’s title, it lists some words that might be hard and separates them into syllables to help you know how to say them. This is a simple book that everyone can read for themselves. Read this page on John Adams. Make a power point presentation on John Adams. This link is one place to get information. Here’s some brief information. You are not allowed to copy and paste words from other websites. That is called plagiarism. You can’t do it. Learn and then write your own words. If you don’t have Power Point or the free version from Open Office, decide on another type of project. Play this concentration game about Jefferson. Write Thomas Jefferson on the next line of your timeline for when he became president. Read the next three sections of the book. Work on your power point presentation. You need to finish tomorrow. You learned earlier about the Iroquois who lived in the East. Take a look at the map at the link. The different colors show different groups of Indians. Notice where the Plains Indians lived. Can you guess at some of the states that are in that area? They weren’t states yet at this point in history, but America is continuing to expand westward. Here is a map of the US. Name at least five states in the area that previous was lived on by the Plains Indians. Read the next three sections of the book. It starts with The Black Man. Present it to an audience. Read it to them. Explain things to them. Answer their questions. Watch this presentation on Native Americans. Read about the Plains Indians. Do NOT click on continue. What type of home did the Plains Indians live in? Draw a picture of it or build it. Read the next two sections of the book about making friends with the Indians. Read briefly about the third president of the United States. Do the online crossword puzzle. Try to answer these questions. Read the correct answer afterwards. You aren’t meant to know the answers. Add Adams and Jefferson’s presidencies to your timeline. Do a Native American craft. Here are alternative for the parfleche. You can use ideas from this week’s art lesson for your drawing decorations. Read the next two sections of the book about the captain’s goods and the river. Tell someone who Sacajawea is and what she is doing in the story. 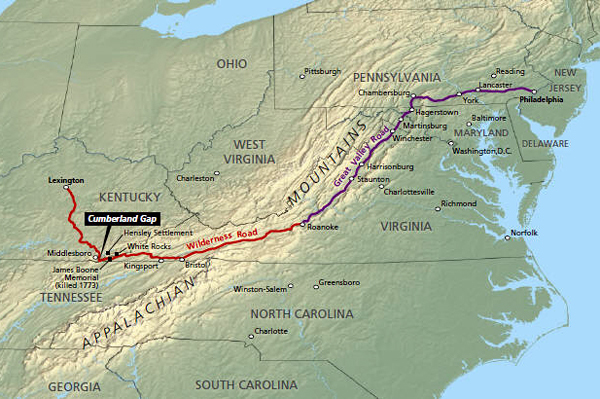 Read the facts about the Trail of Tears. Write a paragraph about the Trail of Tears. Start with an introduction sentence and end with a conclusion sentence. Your paragraph should have at least six sentences. Read the two sections about the Rocky Mountains and her being ill.
Tell someone the stories from the book. Write Lewis and Clark on the last line of your timeline for the year they started on their famous journey to explore across the America. Read this story of Lewis and Clark’s expedition. Read the first little paragraph on this page to see just how much $15 million really was. Write a page about the Louisiana Purchase. *You can use this notebooking page if you like. Read the next two sections about the buffalo and the falls. Tell someone about the how the Indians hunted buffalo. Read an overview of who Lewis and Clark were and what they did. Looking at this map, do you think they found one? Read the next two sections about rattlesnake bites and going around the falls. Tell someone about the stories. Click on number 1 to begin your expedition with Lewis and Clark. Read 1801 through 1804 on the timeline. *Print out a blank map. Draw on the Missouri and Mississippi rivers. Make sure you label them. Mark Camp Dubois as their starting place. (You can zoom out and switch to map to see where it is.) Write a number 1 at the spot. Read about their starting place. Click on number 14. Scroll down to find the numbered map. You’ll read tidbits from Lewis and Clark’s journals along the way. On the back of your map write “1. Camp Dubois” and then add a date and information about it. Read the next three sections on grizzly bears. Tell someone what you read about grizzly bears. 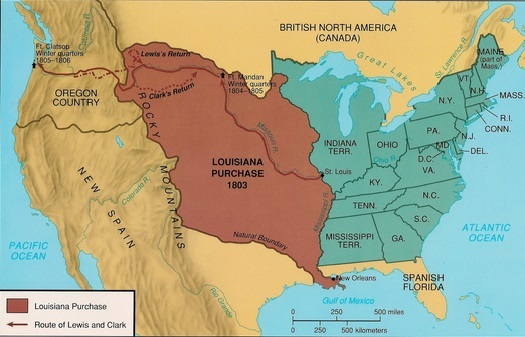 Look at this map of the Louisiana Purchase. It doubled the size of America and made the expedition possible by opening up the land between the East and the Pacific Ocean. Write about it on the back of your map. Always write the number, the place, the date and then information. Read about another stop on the trail. Click on 27. Write about it on the back of your map. What are some of the dangers and troubles they faced? Think about what you read in both places. Read the next two sections about the top of the falls and cloud bursts. Tell someone what you read. Today click on number 2. Read the page. Don’t click on the links. Click on the specimen box link to add what you found to your online collection. Lewis and Clark discovered many new plants and animals on their trip. They collected what they could. They drew pictures and wrote descriptions of everything. This is a list of plants that they collected and wrote about. Click on at least a few of them to look at them. Read about a peace party. Click on 33. Label it #4 on your map. Read about another stop on the trail. Click on 39. The day before they had a tense meeting with some Indians. Find out what happened next. What have Lewis and Clark’s relations with the Indians been like so far on their expedition? Read the next two sections on the source of the river and roots and seeds. Tell someone what you read about eating roots and seeds. Today click on number 3. Read the page and add the buffalo specimen to your box. Pretend you are on Lewis and Clark’s team. Write a note home and tell them about what you have done and seen. Read about a find for Jefferson. Click on 44. Label it #6 on your map. Read about another stop on the trail. Click on 49. Read the next three sections about her people and brother. Tell someone what happened in the stories. Today click on number 4. Read the page and add the grizzly bear to your specimen box. Read about a dangerous situation. Click on 58. Label it #8 on your map. Read about another stop on the trail. Click on 63. What are some other dangers and troubles that they met? Read the next three sections about how they helped and tried to leave. Look at some of the animals they encountered on their trip. Choose another category and see what they found. What did they find on their trip? Choose an animal from the link above with a picture and draw a picture of it and write a description of it like Lewis and Clark had to do in order to share all of their experiences and discoveries with those back home in the East. Have they found a water route to the Pacific? Click on 73. Label it #10 on your map. Read about another stop on the trail. Click on 79. Click on the numbered journey log and read about the adventures of Lewis and Clark. What animals did they encounter? Click on 89. Tell someone as many of the animals as you can remember. What did they think about them? Label it #12 on your map. Read about another stop on the trail. Click on 93. Read the next two sections on the Pacific Ocean. They made it to the ocean, all the way to the other side of the country. They would make it back to the east to tell everyone about it and to share all of their discoveries. Look at this map drawn on Lewis and Clark’s expedition. In your yard or at a park (of if you really can’t get outside, then in your home), draw a map of an area and draw and write descriptions of an animal and of a plant. Click on the most recent date and read about current events. Tell someone what is going on in the world. Watch the Lewis and Clark movie. Add Lewis and Clark to your timeline. Watch this presentation on The War of 1812. Play this causes of the war game. Read about Frances Scott Key. Read about the US declaring war. Read about Washington being burned. Write a paragraph about The War of 1812. It should have at least six sentences in it, not baby sentences, good sentences. Set up your “stage.” Put on costumes. Do what you can. Put on the play. Read the script together with some family members. You’ll need at least one audience member. It’s best to do this with 4 people. *Print out the next page of your timeline, Pioneers. Fill in The War of 1812. Add The War of 1812 to your timeline. You are going to be reading about heading west on the Oregon Trail. Read the page and then read the first two links, who and why. Read this Introduction and then read about Independence Missouri. Make up a person that is going to be traveling the Oregon Trail. Choose a name, age, and reason for going. Every day you will write a diary entry as that person. Today write about why you decided to go west. You can type, or if you want notebooking pages, you can print some. Read the introduction to the Oregon Trail. Read about why people traveled west on the Oregon Trail. Make up a person that is going to be traveling the Oregon Trail. Choose a name, age, and reason for going. Every day you will write a diary entry as that person. Today write about why you decided to go west. You can type, or if you want notebooking pages, you can print some. Be talkative. Don’t just write a few sentences. Today you are going to read about where they traveled and what trails were used. Read the journal entry from Fort Kearney. Write in your diary about what happened on the trail today. Make sure you tell where you are. What is today’s date? Write in your diary about packing and how things went the day you “jumped off.” Make sure to put a date on the page. Today read about what they took on the trail and how they traveled. Read the journal entry from the Platte River. Today write about what happened today. Write about what trail you are on and how you are traveling. Choose at least one historic site to write about today. Remember to write it as a diary entry. Put a date on the page. Read about what a wagon was like. Read the journal entry about Chimney Rock. Learn the parts of a wagon. Letter H doesn’t work, but I bet you know what that is. Read about animal power on the trail. Write about your choice of animal and what good and harm they have caused on your trip so far. Read about wagon train and who led them. Read the journal entry about Independence Rock. Write about what happened today on the trail. Make sure you write about your wagon train. Read about hardships on the trail. Write about what hardships you have faced on the trail. Read about what were their lives like and life at their new homes. Read the journal entries about the Rocky Mountains and Soda Springs. Tell someone about what you learned today. What were their lives like at their new homes? Write about what your daily life is like. Make sure you write it as a diary entry. Make sure you are putting a date on each page. 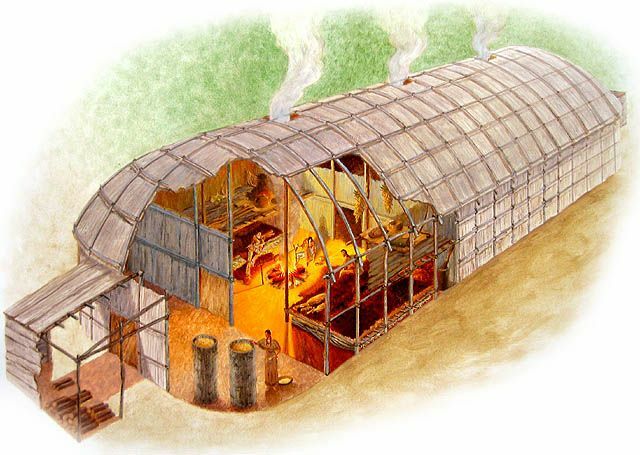 Read about cooking and fire building. Read the journal entry about Snake River. Write about what happened on the trail today. Make sure you write about cooking or building fires. Did you have chores you had to do? Read about this sweet-smelling chore. Write about the chore or the game 🙂 as part of your diary entry today. Read about crossing rivers and tools. Read the journal entry about Fort Boise. Write about what happened today on the trail. Write about having to cross a river. Write about an encounter you had with Native Americans on the trail. Read about first aid and pastimes. Read the journal entry about Walla Walla. Write about what happened on the trail today. Write about getting injured or playing a game. Learn the parts of a wagon. Did you learn them? Try the quiz. Read about Dangers on the trail and toys. Read the journal entry from Fort Vancouver and conclusion. Write about what happened on the trail today. Write about what danger you faced. Read about manifest destiny, its definition and its political, economic and social reasons. *Read this worksheet, follow the directions, and answer the questions. *Print out this page on packing a wagon. Check off the things you want to take. Each time you add something to your wagon, add it to your total weight. You can’t take more than 2000 lbs. (Use a calculator. If you don’t have one, use one online. What did you end up bringing? Fill in Oregon Trail on the second line of your Pioneers timeline. Read all of the fantastic facts about the Oregon Trail. Read about how the Gold Rush got started. Tell someone about the beginning of the gold rush. Read the history of the Alamo. Tell someone about the Alamo or write about it. Tell someone what it was like to be a 49er. Read an overview of the gold rush. Watch the video on the page. It’s a “history detective” piece. Write about the gold rush. Tell someone about foreign miners. Read about the Chinese immigrants and the Gold Rush. Write about the gold rush or tell someone about what you learned. What did you learn from those pictures? Write Gold Rush on your timeline. Click on each image and read the answer to the question under the picture. How was the mail delivered? Then you can choose a picture to color. Was it easy or hard to strike it rich? What happened to your character? Add the gold rush to your timeline. Watch this short video on the pony express. Read facts about the pony express and look at the map. Write Pony Express on your timeline. Read about the Pony Express. Read chapters 1 and 2 of the juvenile version of Uncle Tom’s Cabin. Tell someone about what you read. You are going to be following the story of Eliza, Harry and George and Uncle Tom. Read chapters 3 and 4 of Uncle Tom’s Cabin. Read chapters 5 and 6 of Uncle Tom’s Cabin. Read chapters 7 and 8 of Uncle Tom’s Cabin. Do the Sojourner Truth matching game. Read chapters 9 and 10 of Uncle Tom’s Cabin. When you see weird spelling of words, that’s the author trying to write the words the way they were pronounced by the character speaking. The slaves often speak this way in the book. Sound out the words out loud to help you figure out what they are saying. Read chapters 11 and 12 of Uncle Tom’s Cabin. Find out about Harriet Tubman’s early life. Describe Harriet Tubman’s childhood. What was one of her jobs as a child? How did she get a scar on her head? Read chapters 13 and 14 of Uncle Tom’s Cabin. Do number 2 on the Harriet Tubman web quest. Read or listen about life on a plantation. Read chapters 15 and 16 of Uncle Tom’s Cabin. Do number 3 on the Harriet Tubman web quest. Read or listen about escaping. Read chapters 17 and 18 of Uncle Tom’s Cabin. Do number 4 on the Harriet Tubman web quest. Read or listen to safety. Read chapters 19 and 20 of Uncle Tom’s Cabin. Eliza and George are almost caught. The leader of those trying to catch the slaves, Tom, is wounded and the rest run away. The Quakers would not use guns. George had fired at Tom. Even though they were fighting him, they took Tom to the house with them to care for him until he was better. Everyone he had been with just abandoned him. Read or listen about reaching freedom. Read chapters 21 and 22 of Uncle Tom’s Cabin. Do number 6 on the Harriet Tubman web quest. Play the Day in the Life game. Read chapters 23 and 24 of Uncle Tom’s Cabin. Topsy doesn’t know right from wrong. She has only been treated meanly and never loved her whole life. She never even knew her mother. *Make a Harriet Tubman book. Choose one: full color pictures with many pages; simple one page with small b/w and color pictures; lift-the-flap book with several pages, all b/w, for a young reader. If you don’t want to make a book, you can read the first one online. Read chapters 25 and 26 of Uncle Tom’s Cabin. Learn about the Pathway to Freedom. Topsy seems to have been told that she is wicked, so she acts wicked. The pillows are stuffed with feathers and she takes off the pillow cases and rubs her hair in the pillow stuffing until her hair is full of feathers. She won’t do her work if she is left alone. She isn’t bothered by whippings because she’s been beaten so often. Play the Flight to Freedom game. You’ll have eight days to play this. It’s hard to get free. You’ll need lots of tries. Read chapters 27 and 28 of Uncle Tom’s Cabin. Play the Flight to Freedom game. Read chapters 29 and 30 of Uncle Tom’s Cabin. The paperwork wasn’t finished though. Read chapters 31 and 32 of Uncle Tom’s Cabin. Mrs. St. Clare thinks that slave owners are good people and that Tom is better off being a slave than free. Is she right? What do you think? Why? Readchapters 33 and 34 of Uncle Tom’s Cabin. Read chapters 35 and 36 of Uncle Tom’s Cabin. Read chapters 37 and 38 of Uncle Tom’s Cabin. Read chapters 39 and 40 of Uncle Tom’s Cabin. Read the Uncle Tom’s Cabin Bible story. Read chapters 41 and 42 of Uncle Tom’s Cabin. Write about Uncle Tom’s Cabin. Retell the story in your own words. Write why you think this book helped many people decide that slavery should end. Read chapters 43 and 44. You can keep playing the Flight to Freedom game. Tell your story. Answer the questions to tell about your life as a slave. It’s easy to say that slavery is wrong. Can you see anyone else’s point of view? Try this writing assignment. Simon Legree has been charged with Tom’s murder. You considered resigning from your law firm, which Legree hired to defend him, but your boss talked you out of it. Now you have been assigned to write a brief explaining why Legree should be convicted of a lesser charge. Write an essay in which you present any evidence and / or logical arguments you can find to support the idea that, considering Legree’s culture and the circumstances surrounding Tom’s death, Legree should not be charged with capital murder. Read all of the slave stories (link below). The links are on the right-hand side. Then, tell your story. Answer the questions to tell about your life as a slave. Click on Play Online Game at the bottom of the reading. Read about Abraham Lincoln’s childhood. Click on all of the “Read More” links. Take the quiz when you are done reading. The link is at the bottom of the page. *Complete this matching worksheet on the life of Abraham Lincoln. Watch this video on Abraham Lincoln. Watch Growing Up on the Frontier. Watch The Call of Leadership. Write a paragraph on the beginnings of Abraham Lincoln. Watch the video, The Boyhood of Abraham Lincoln. Watch the video, Abraham Lincoln Visits His Boyhood Home. Tell someone about Abe Lincoln’s life. Write a paragraph about the Emancipation Proclamation. Look through all of the pictures in the three photo galleries. Draw a picture that shows something about Abraham Lincoln. Explain your drawing to someone. Watch the Second Inaugural Address. Write a paragraph about Abraham Lincoln as war president. What were his goals? Was he successful? Or, choose a few activities from this booklet on Abraham Lincoln. Look at this map of America at the start of the Civil War. Click on the different symbols in the map key to see those elements on the map. Click on questions to think about and answer all four. Read the overview of the Civil War. Read through the timeline of the Civil War. Keep scrolling. *Slavery and the Road to War — Look at this map. Click on Slave Population. Where were all the slaves? Click on Agriculture (that means farming). Where were all the farms? The South needed slaves to work their farms. Without slaves they couldn’t produce as much cheaply and couldn’t make as much profit (money). You are going to be doing a final, end-of-the-year project. You can choose to learn more about anything from history from Native Americans up through the Civil War. Once you have chosen what you are going to do for an end-of-the-year project, the second step is to decide what type of project are you going to do. You can make a lapbook, a poster, a power point presentation, an online presentation, or a scrapbook either on paper or online. You could write and put on a play or give a speech. Or, you can think of something I haven’t thought of. Choose what you are going to do. This looks great! I can’t wait to start it next year with my son. This is one of my favorite time-periods because we live in the Boston area so we can go on lots of field trips to historical Boston locations, The Adams House, Plimouth Plantation, the Mayflower and so many more places that were important during the colonial settlement and revolution.